Ever since I first heard about wrapping a pork loin in bacon before roasting it I have been wanting to try it! Now that the cooler weather is here it is time for more comfort food and the bacon wrapped pork loin quickly made it to my meal plan. I was thinking that I would keep the roast pork loin nice and simple and just go with a rub of some Montreal steak spice but when I was at he grocery store picking up the bacon they had maple bacon on sale and I could not pass up on adding a maple theme to the roast. So I covered the pork loin in maple syrup followed by the spice rub and then I wrapped it all in the maple bacon. After the pork roast was almost done cooking I glazed it in some more maple syrup. The bacon wrapped maple roast pork turned out so amazingly well! The bacon wrapping helped keep the pork loin nice and moist and juicy and good. The sweet and salty bacon went so well with the spice rub and the maple flavour! I found myself going back for seconds and thirds of the roast pork before I knew it. 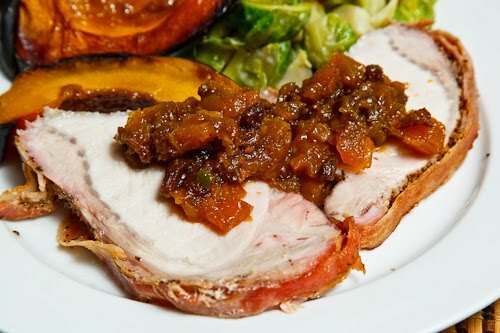 I had planned on making the bacon wrapped roast pork at the same time as the apple chutney as apples and pork are always a nice combo and I thought that the spicy apple chutney would go well with the bacony pork. I also served the roast pork with some maple roasted acorn squas h and some brussels sprouts and bacon covered in melted gorgonzola . Brush the maple syrup onto the pork and rub the steak seasoning into it. Wrap the pork loin in the bacon and place in a baking dish. Roast in a preheated 350F/180C oven until a meat thermometer reads 140F, about an hour. Brush the maple syrup onto the bacon. Roast until the meat thermometer reaches 150F, about 10 minutes, and remove from oven. This looks delicious, I have never tried wrapping anything in bacon. I am missing out, this must be delicious and would keep the roast extra moist. Yum! If you like things wrapped in bacon…I cover my meatloaf in bacon before baking it…Major YUM! Oh I'd take this over turkey for Thanksgiving any day! Sounds very very interesting. I am curious to know whether with the powerful flavors of the bacon, maple syrup and the apple chutney, did they overpower the taste of the pork loin at all? I don't know what else can be better that bacon and pork put together. I really can't. Yum yum!! YEAH for bacon and apples! They are so good together. I wouldn't mind pigging out on this delicious plate of food!!!! The apple chutney seems ideal to counter the greasiness of the pork!! Maple and bacon are a great combination to have with pork. And just in general. Perfect comfort food, especially with that chutney! You had me at bacon wrapped…. It looks delicious! For some reason I cannot stomach the pork-apple flavor combination, but I will definitely make the pork by itself. wrapped in bacon? sounds like an early christmas present! heehee.. this looks yummy..
Ohhh … the title just won me over from the start and I opened the post and took a look at the photo and recipe and this just sounds divine. I like the mapl bacon and it must have paired so well with the apple chutney. A Google search for "pumpkin enchilada" linked me to your blog early last week, and I've been pouring over your recipes ever since! This past weekend, I made a variant of your kabocha risotto (pureed the entire squash and used vegetable stock, also added a pinch of nutmeg) which was a total hit at a squash-themed dinner party. 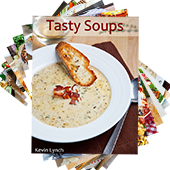 I really like how creative, ingredient-focused, and boldly-flavored your recipes are – I think our tastes and level of skill/effort in the kitchen are very similar. I also used to cook in a kitchen that could not fit two people (I've moved up only slightly now), so I definitely empathize. Anyway, keep doing what you're doing, it's really great, and I can't wait to see what cool food you'll make next! I often make a pancetta wrapped pork roast but my next step will be to try this apple chutney. Well done! My husband and kids like when I wrap the loin in bacon (just don't over-salt the loin before wrapping it). So much of the pork loin sold is very lean and the pork really needs something to help keep it moist, and bacon adds a nice flavor too. If you have a lot of leftover pork, you can cut it up/dice it and use it in fried rice. It's really yummy. Do you think turkey bacon would do the trick? Starting to drool al over my keyboard! Tell me you have tons of friends and family to share all the yummy food you create!! They are blessed. OK — the bacon is fine, here. But the maple syrup has gotta be what does this dish in. Yum. looking for something different, I'll try this…. Last week I made a bacon wrapped stuffed pork loin with Stove Top pork stuffing mixed with raisins that had been simmered in a pan with apple brandy and sauteed diced apples. I made a "bacon weave" to wrap the loin in. I would suggest that the fat cap on the loin be removed, as it didn't render down by the time the internal temp reached the proper point. The bacon alone will prevent the the loin from drying out.